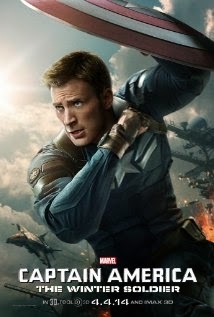 Plot: Captain America is forced into a battle with an old foe, but he must be careful because he's not sure who he can trust. It is surprising that the studio decided to release this movie in early April rather than wait for the summer blockbuster season. It fits all the criteria for a summer blockbuster: explosions, action, explosions, hot girl that might be good but is probably bad, explosions, epic fight scenes, a good guy that turns out to be bad, explosions, a bad guy that turns good, oh...and a super-good looking hero that slowly walks away from explosions. CAPTAIN AMERICA is exactly what we have come to expect from the MARVEL series. It's an excellent action movie and a really good, fun time for viewers. Chris Evans (Steve Rogers/Captain America) and Scarlett Johannson (Natasha Romanoff/Black Widow) play well off of each other giving the audience entertaining and witty banter throughout the film. There are several great moments throughout the movie that had our audience breaking out into applause a good six or seven times. (MARVEL movies are always best to see with uber fans). We also get some answers to long-held questions from the first CAPTAIN AMERICA movie. THE WINTER SOLDIER is better than the original because it is much faster paced and we get to see a more developed hero. It's still not quite as good as the IRON MAN or THOR series, but it is definitely a worthy competitor. As with all of the other MARVEL movies there are a couple of things to look for while munching on your popcorn: 1. Stan Lee (MARVEL creator) has a cameo. Look for him in the Smithsonian, 2. There are two secret scenes at the end of the movie. Wait until the very end of the credits to see both. The end-of-the-movie tease aheads will make for some interesting conversation among the MARVEL geekdom and fans of the movies. I won't say much as not to ruin anything other than, yes, that belongs to Loki. If you like action movie and/or comic book based movies I highly recommend this one.